Hmmm…guilty as charged. The Christmas tree hasn’t been put up and decorated with all the shiny baubles in the last few years. But the grandbabies are coming on Christmas day this year! I need the Christmas magic around my house this year. The tree, the baubles, the trimmings, the lights…it is coming out to transform my home into a place of holiday cheer. I need a tree skirt. A glittery tree skirt. There are metallic fabrics that have been living in my stash for many a year. These fabrics are creating a wonderful skirt to dress up the Christmas tree! Shiny red and green rayon thread is machine quilted on some of the wedges of the skirt. And gold metallic thread on the other wedges. I had some trouble with that metallic thread, but encouragement from a few friends, and perseverance pays off! I rarely make bias binding, so I referenced one of my favorite patchwork books to refresh my memory on the best way to make it. This neutral fabric with metallic dots wasn’t my first choice for binding, but it was the only fabric in my stash that I had enough of. The binding turned out to be a nice accent. The free motion quilting gave the skirt great texture! There will be cookies this year, too! I am a very blessed girl indeed! I have thanked the sponsors already, but I want to share their generosity publicly. As some of you know already, I have been participating in QuiltShopGal’s 2015 Free Motion Pillow Challenge. The challenge is not a contest; it is for education and fun. However, there are generous sponsors, and winners are randomly selected using a random number generator. I was randomly selected for prize #3 in March! With my prize certificate, I received these fabrics from Fabrics N Quilts! The day that I discovered Karen’s Quilts, Crows and Cardinals – Redbird Quilt Co. blog, she was hosting a giveaway, and I thought, why not? Linda Hrcka, from The Quilted Pineapple, was generously offering a set of her QP Curved quilting templates. The winner was also selected by random generator. I have not had time to play yet, but I am so looking forward to it! Many, many thanks to Darlene, Fabrics N Quilts, Karen, and Linda! I just might enter more giveaways. How about you? This month’s initial pillow is for my oldest granddaughter (who is not all that old). I appliqued a pink letter A onto a patchwork background. I am using 50 weight Aurifil in the bobbin. I tried something new to me for my top thread…Wonderfil’s Konfetti, also 50 weight. I had trouble with it fraying until I switched to a size 14 needle. Then all was well! I like Christina Cameli’s peapod free motion quilting design, so I used it here. I stitched with a small scale, so didn’t really like how it turned out. At first. After I got the whole picture, I decided the texture was pretty cool. However, I still think I’d like the peapod design stitched out on a larger scale better. The peapod fmq design is alternated with Christina’s branching free motion quilting design. I felt the same about the results of this stitching, as I did with the peapod stitching. The back is made from a sweet plaid, and has a concealed zipper. I chose option #4 from QuiltShopGal’s 2015 April Free Motion Quilting Challenge. I am linking up here. 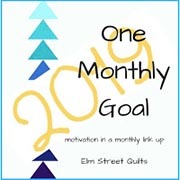 Check out Christina’s blog; she has many ideas and tips to help and inspire your free motion quilting! My daughter signed me up for Ali Edwards’ One Little Word class (She did ask if I would like to try it first.). My daughter is a creative, prolific scrapbooker, and I love what she does. She has played with paper ever since she was a tiny tot. I, however, am not a scrapbooker. But she assures me that I don’t have to be to enjoy this class. In fact, she bought a journal for me instead of a binder. I haven’t written a word in it, yet, but I love it! I will write in it soon. As you can see from the cover of the journal, I have chosen the word ‘Joy’ for my word this year. I’ve had some tough times the past few years and I’ve lost my ‘muchness’. I understand that joy is an attitude; a choice. But it is much more than that, and I shall be exploring it this year. I hope to be a better person by the end of this year. I splurged and bought a reminder to wear everyday. I love this cuff bracelet! It is hand made, well made, and I supported the maker in my small way. I had decided that I wanted a pillow, and then I saw the 2015 Free Motion Quilting Challenge. For January, there are three options to choose from. I’ve chosen a variation of Option #3. Using water soluble thread, I sewed two layers of batting underneath the letters and the surrounding heart shape. After sewing, I cut away the excess batting. I chose a 12 weight orange Aurifil thread to outline the letters and heart shapes. The filler was sewn with a 50 weight cream Aurifil thread. All of the stitching is done with free motion. I need a larger pillow form to fill out the pillow cover better. It is on my shopping list. My happy place, the sewing studio, is lime green and white. Orange poppies and lime green (functioning as the zipper cover) make me smile. This pillow will fit right in! The October Free Motion Quilt Challenge at SewCalGal is a tutorial from the guest expert, Teri Lucas. Terri is very encouraging, and had us begin this month’s tutorial by drawing on paper. She had us practice with our names and then add designs. I chose Aurifil 50 weight thread and muslin to free motion quilt with. This is because it is fall, and I didn’t want shiny materials. I felt artsy and country bumpkin. Thread sketching and free-motion quilting. I need practice with blending/shading for sure! The September Free Motion Quilt Challenge at SewCalGal is a tutorial from the guest expert, Paula Reid. I feel a bit of an affinity for Paula since she lives in Palmdale, CA. Hubby and I have family living in this area, and we both graduated from Antelope Valley High School in Lancaster, CA. Paula’s tutorial has us practicing our free motion quilting with a stencil. I drew the design onto my fabric with a blue marker and the use of a light table. I used a 12 weight Aurifil to quilt the stencil. I needed a larger needle and couldn’t find a Schmetz denim sharp (my needle of choice) in the size I wanted. So…I used a Schmetz leather 100/18. I know! But I was desperate! I think this might look nicer if the the thread colors were reversed, but, in any case, this will make a lovely pillow someday. The August Free Motion Quilt Challenge at SewCalGal is a tutorial from the very talented Wendy Sheppard. Wendy is a pattern designer, teaches free motion quilting, and has been published in several quilting magazines. She generously shares projects, tips and techniques on her blog, Ivory Spring. Wendy shares her “Jester” free motion quilting design for this challenge. I’ve been following her blog for some time, so I’ve had opportunity to practice this design already. In fact, I used it in June’s challenge. I decided to use this design in an art quilt that I am working on. You can find that quilt here. I’ll be practicing this design more, as I still must concentrate to change directions. For some reason, I have a mental block changing directions. I also want to try Wendy’s variation of her design. This photo is the back. You can see it better, I think. I am using Wonderfil Invisfil 100 weight polyester thread in the bobbin and Mettler 60 weight cotton embroidery thread in the top. My tension is set on 0.